Discussion in 'Model X' started by scottf200, Dec 23, 2015. A VRLA battery (valve-regulated lead-acid battery), more commonly known as a sealed battery (SLA) or maintenance free battery, is a type of lead-acid rechargeable battery. Due to their construction, the Gel and AGM types of VRLA can be mounted in any orientation, and do not require constant maintenance. Huh, I wonder if most portable boosters will even reach both posts. They look kinda far away from each other. From the title I had hoped these were how to tow with your X instructions. Do we have the Model X owners manual PDF yet? 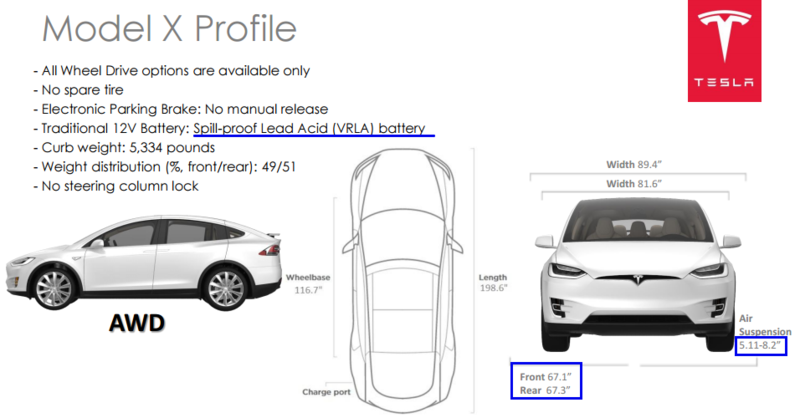 Can we assume the frunk on the X has a manual release? 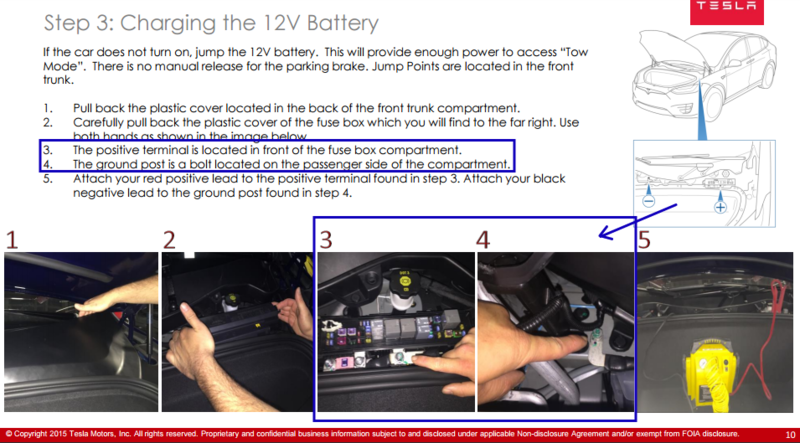 The towing guide also has the instructions to manually release the Frunk. The key take away from this is the Model X frunk is not a secure location to store things even if the car is locked. What?! I don't see that being a smart thing?! Come to think of it, there's not a lot of stuff you could put up there. Since it's not automated to open the frunk, it would be a good idea to put things there you would almost never need, or in special occasions (such as travel). The frunk isn't really an easy place to put stuff, considering all this. I would be tempted to put a first aid kit there, as well as other emergency provisions, in such a manner it doesn't cause a hazard in the crumple zone. Edit: oh. someone else already posted it. It bears repeating, though. Isn't the same thing true of a Model S? What I find interesting is that there are steps that require access to the touch screen. That assumes a 'friendly' tow, as opposed to a tow by law enforcement or similar involuntary towing. How is that accomplished if you have the air suspension? Right, the recent Model S Frunk can also be similarly opened using straps from the outside. The older Model S required using the manual release inside the car. Yea, I was under the impression the frunk only opened from the inside... Opening from the outside is awful. you can't open the hood of any other car without inside access. (Other than a wrangler). That's not quite true. I googled a bit and the Porsche Boxster (which also has a frunk) can be opened by pulling a cable behind the headlight (which can be reached either from the wheel well or by popping open a headlight). There are probably other examples (the 911 probably is similar).